Every nation has its rules about what goes and what doesn’t when it comes to gastronomy. Coffee here as we know is drunk sweeter than sweet. Those of us who decline any sugar at all are considered eccentric at best. In the same way as Italians who react with horror at ignorant foreigners who flout the cappuccino/espresso rules (cappuccino – morning; espresso – after lunch, only, ever) I have been in situations where Dominican friends watch with riveted interest as I sip my ‘cafe amargo’, presumably to see whether my eyes pop out. In fact what is guaranteed to have such an effect is serving me a sweetened coffee. The same goes for jugos naturales (fresh vegetable or fruit juices). A Dominican will say he hasn’t eaten if rice was not served with the meal. This reminds me of the traditional English attitude that if a meal hasn’t got meat, potatoes and ‘two veg’ (typically brussel sprouts and carrots boiled beyond recognition) it isn’t a proper meal. The rice rule for Dominicans is basically that the midday meal should consist of rice, beans, meat and salad. I have come across some who will turn down rice for the evening meal, preferring something much lighter. I have never had any objections to rice-free dishes at either meal from Dominican friends and relations, but my husband tells me that they’re just being polite. Ways of cooking things also make for culture clashes. Once, when watching a Dominican TV cooking programme with my mother-in-law, the dish of the day was an Italian-style tomato sauce. The TV cook was seasoning the sauce with oregano leaves. La Doña turns to me and says in a disapproving tone: ‘you can’t put oregano with tomatoes!’ Oregano here is a popular seasoning for beef, but as opposed to the fresh or dried oregano of Italian cuisine, in the DR it is ground and tastes altogether different. And then we have ‘viveres’, such an integral part of the diet here. One of my sisters-in-law subsists almost entirely on plantains, boiled green bananas, and mangús of various types, and finds it impossible to believe that there are people who go through life without knowing what they are, let alone tasting them. I finally managed to convince her of this when we came across some overpriced plantains in the supermarket in Spain. The plantains were in the ‘exotic’ section, and were labeled ‘plátanos de freir’. In Spain of course, ordinary bananas, ‘guineos’ here, are called ‘plátanos’. Charo immediately called over one of the employees: ‘there are other ways to cook a plantain, you know’, and with a tear in her eye she listed all the diverse and wonderful dishes she was missing so much. I myself am taking it slowly. I love my viveres fried or roasted: mainly tostones and yuca, but I’m still not so sure about boiled and mashed. And finally – while this doesn’t exactly fit into the category of cuisine, it just about qualifies as gastronomy: only the Dominicans know how to serve a beer at the correct temperature! And while it might be cold(ish) already in some parts of the world this time of the year, in the Dominican Republic it’s always summer. So sure, a warm drink will probably suit you better these days, but I also want to bring you a bit of our sun and warmth. And if you enjoy the occasional cold drink with your meal, then do we ever have great ones for you. 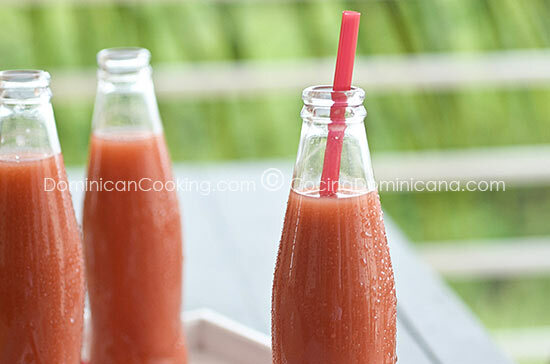 Jugos de Frutas y Vegetales Recipe (Fruit & Vegetable Juices): If you think that carrot or beet juice taste funny, fear not, orange and lime do the trick. The little ones will love it. West Indies cherries ("acerola" or "cereza" in Spanish, "cerise" in French) is different from the cherries grown in colder climates. Cut the beets into large cubes. Blend with the water until there are no chunks. Sieve and get rid of the solids. Cut the carrots into large cubes. Mix in the orange juice. Blend the cerise with the water until there are no chunks. can you used the beets from the can? No! Definitely better to go with the real thing. It's super hot here in Puerto Rico, so these juices 'caen como anillo al dedo'. For the cherry/cerise juice, is it okay to leave the seeds in the cherries when you blend? Yes, you can. After all it was removed when you sieve it.